Federal law enforcement officers hold a police line at the Portland ICE building on SW Macadam Avenue Thursday, June 28, 2018, after officials worked to clear the entrance to the building. Oregon’s sanctuary law for immigration is simple on paper. It says no law enforcement agency can use its money, equipment or personnel for the purpose of detecting or apprehending people whose only violation is being in the country unlawfully. But what makes the law confusing is that it has not been interpreted by the courts. In November, voters in Oregon will decide Measure 105, which asks whether to keep the 31-year-old law. “We would like to repeal the law so that state and local law enforcement officials can cooperate with immigration authorities in removing people here," said Cynthia Kendoll, who is the president of Oregonian’s For Immigration Reform and the campaign manager for Measure 105. She spoke during a debate last month on OPB’s "Think Out Loud." “The repeal of this law would not turn state and local law enforcement officials into immigration officers," she said, adding that local officers should be able to work with Immigration and Customs Enforcement agents to detain people living in the country illegally. Supporters of Oregon’s sanctuary law disagree. They argue if the law is repealed, local law enforcement will be seen as an arm of federal immigration authorities. Andrea Williams, executive director of Causa, an immigrant rights organization, wants people to vote no on Measure 105. During the Measure 105 debate, Williams pointed out that Oregon’s sanctuary law allows police and sheriffs to verify the immigration status of someone arrested for something criminal. It allows local law enforcement to request information from ICE for criminal investigations. “What the law also protects against though is serious civil rights violations to ensure that no one is singled out simply for how they look, the color of their skin, their accent or their perceived immigration status," Williams said. A campaign committee set up in favor of repealing the law has raised nearly $40,000, according to the Oregon Secretary of State. That's dwarfed by a committee that supports the law, which has raised more than $535,000. Oregon’s sanctuary bill passed the Legislature almost unanimously. It was signed into law July 7, 1987. “Both Republicans and Democrats voted for the bill. 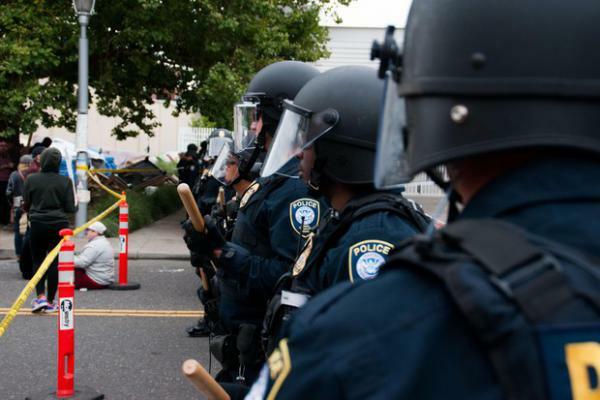 It was really not controversial," Rocky Barilla, the now retired Democratic state representative behind the law, told OPB in 2017. “To be honest, this was not meant to be a sanctuary law," he said. "It was meant to protect local city resources." He added it was also meant to prohibit racial profiling. Before the law was passed, Barilla said local police and sheriffs would harass and target people in public based on their race. In 1977, Barilla was working as an attorney. He filed a lawsuit against the Polk County Sheriff’s Office after they targeted an American citizen during an immigration raid at a restaurant in Independence, Oregon. Measure 105 is part of a larger immigration fight. Nationwide the Trump administration has advocated for a closer relationship between law enforcement and ICE. At the same time, leaders in sanctuary cities — and states like Oregon — have pushed back. An additional complicating factor is Oregonians for Immigration Reform — the group advocating for yes on Measure 105 — was recently labeled a hate group by the Southern Poverty Law Center. Kendoll and others who want to repeal the law have been accused of advancing a false narrative with statements like the one she used during the Measure 105 debate: “We are recycling criminal aliens, putting them back on the street, so they can inflict their damage again." There have been some high-profile crimes committed by immigrants in the country illegally. But supporters of the law say the Vote Yes on 105 campaign is trying to draw a false line between immigrants and criminal activity. Research across the political spectrum shows immigrants commit crimes at the same level — or less — than people born in the United States. If Oregon’s sanctuary law gets repealed, it could become an even larger part of the Republican Party’s agenda as the GOP looks to the 2020 presidential race and beyond. It's less clear what the law's repeal would mean locally. Some communities with sanctuary laws of their own would likely see little change. But some county sheriffs who have supported the measure would see it as an opportunity to work much closer with federal immigration agents.